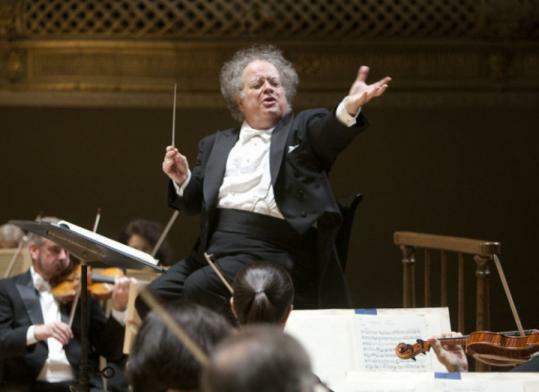 James Levine withdrew yesterday from his appearances for the remainder of the Boston Symphony Orchestra’s season due to lingering back problems, disappointing patrons and forcing the orchestra to scramble to find conductors for the maestro’s two remaining weeks of Boston performances and an upcoming East Coast tour. Before last night’s concert at Symphony Hall of Mahler’s Symphony No. 9, which was conducted by assistant conductor Sean Newhouse, attendees greeted the news about Levine, 67, with a mixture of sadness for him and frustration for concert-goers. The announcement of Levine’s withdrawal came just two days before he was to lead the orchestra in its only world premiere of the season — a BSO-commissioned violin concerto by British composer Sir Harrison Birtwistle, featuring the German violinist Christian Tetzlaff. Levine, whose tenure has been marked by artistic highs but physical ailments that have kept him on the sideline for extended periods, was not available for comment, the BSO said. There was also no word of Levine’s plans for the summer season at Tanglewood. Last year, in a similar scenario, Levine missed more than half of the Boston Symphony’s 2009-2010 season, and then in June announced that he had not recovered enough to conduct at Tanglewood and had to cancel there as well. Despite his latest BSO cancellations, which cover tomorrow through March 19, Levine, for now at least, is still scheduled to conduct his upcoming performances at the Metropolitan Opera in New York, which begin on March 30 with “Das Rheingold’’ and run through May 14 with “Die Walkure,’’ according to the Met’s press director, Peter E. Clark. Levine also serves as music director of the Met. The BSO withdrawals include seven concerts at Symphony Hall, three at Carnegie Hall, and single performances at New Jersey Performing Arts Center and the Kennedy Center in Washington. Those concerts will still take place, and the BSO, which declined to comment beyond a short press release, said it would have updated program information at some point today. This is not the first time the BSO has been left to hustle for replacement conductors. But there is a growing frustration among ticket holders, many of whom have grown weary of purchasing tickets to see Levine conduct only to learn days before that he would not. Levine took over as music director in 2004, but his health setbacks began in 2006 when he fell and tore his rotator cuff during a standing ovation at Symphony Hall. He missed most of the 2008 Tanglewood season after surgery to remove a kidney with a cancerous cyst. Levine’s latest back surgeries forced him to miss 22 concerts, or 60 percent of his scheduled performances during 2009-2010, plus eight concerts at Tanglewood. “These four weeks he’s now taking off to get his health in order,’’ Ronald Wilford, Levine’s manager, told The New York Times yesterday (Wilford did not return calls to the Globe). He said Levine had a procedure stemming from complications involving a nerve about 10 days ago, and needs time to recuperate. “Every time something happens, it seems to affect the Boston Symphony,’’ he said. Last week, Levine pulled out of performances of Mahler’s Symphony No. 9 because, according to the BSO, he was having problems with his back that were complicated by a viral infection. Newhouse took over the program. With his high-profile jobs, Levine is the highest-paid conductor in the country. He earns $1.7 million a year from the Met and just over $1.5 million from the BSO. Levine is paid “roughly less than a quarter’’ of his annual compensation for his administrative work, according to a BSO spokeswoman, with the rest in the form of concert fees. He does not receive those fees if he does not conduct. David Weininger, who writes the Classical Notes column for the Globe, and Jeremy Eichler, the Globe’s classical music critic, contributed to this story. Geoff Edgers can be reached at gedgers@globe.com.